Map of Peru, Ecuador, and Brazil depicting the Marañón River, the principal source of the Amazon. 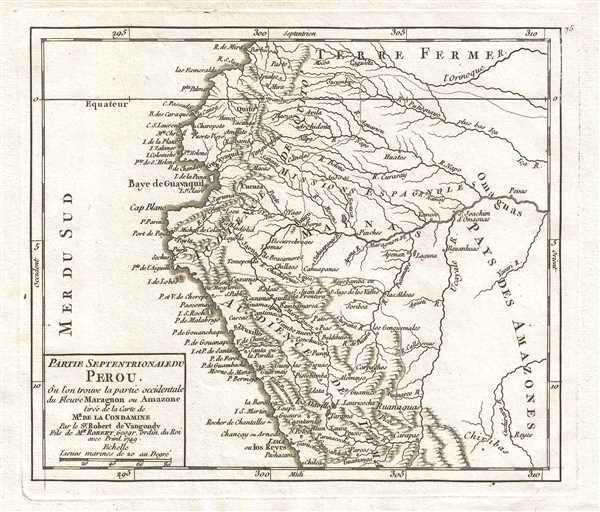 This is a 1749 Didier Robert de Vaugondy map of northern Peru (Perou), Ecuador, Brazil, and Colombia. Depicting from Colombia to just south of Lima and from the Pacific Ocean to Brazil, the map centers on the Marañón (Maragnon) River. The Marañón is the principal or mainstem source of the Amazon River. The map presents a highly-detailed view of the region, depicting numerous rivers and their tributaries and labeling several locations along the coastline. Countless cities are labeled, including Guayaquil, Quito, and Lima. The Equator also runs through the top portion of the map. Pedley, M. S., Bel et Utile, p. 217, 490. OCLC 431576268.